This digital case is designed to fully support all your mobile technology. Compatible with most iPads®, tablets, e-readers, and some netbooks, this tech-friendly case will protect your electronics on the go. On the Outside, there's YKK® RC zipper hardware for smooth, self-repairing zipper action and ergonomic double zipper pulls. SpeedThru™ pocket for quick storage of items at security checkpoints. Slip pocket on back panel to easily tuck away shoulder strap when not in use. Hidden zippered privacy pocket on back panel. Slip-through back strap allows bag to slide over any Briggs & Riley Outsider® handle for fast, convenient travel. HideAway™ ID tag that conceals personal information. Available in Black (shown) and covered by Briggs & Riley signature Simple As That® lifetime warranty. 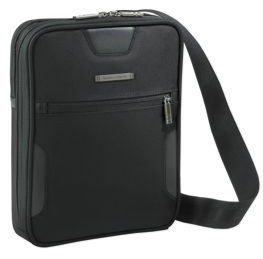 In the Inside, this case has fleece-lined padded compartments for high-tech gadgets like tablets, smartphones, and mp3 players, plus pen loops and elastic pocket for any business peripheral. RFID blocking pocket for credit cards and passports hinders unauthorized access to personal data.